Infants and children up to age 5 who live in Vermilion County, have a medical or nutritional health risk and meet income guidelines. 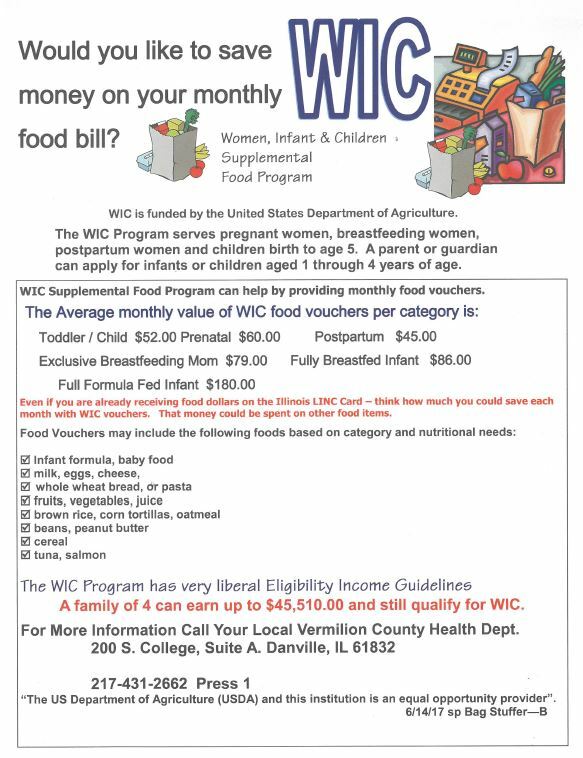 Click HERE for Current WIC Income Eligibility Guidelines. *WIC promotes breastfeeding as the optimal source of nutrition for infants. Special infant formulas and medical foods may be provided when prescribed by a physician for a specified medical condition. No Post Office Box addresses accepted. Walk-In Wednesdays – No appointment needed. Call if you have questions. WIC is at Carle Hoopeston the 2nd, 3rd and 4th Tuesday of the month (except Holidays) from 8:30AM-3:30PM.